6.17 points at 12 votes (rank 594). The story: One of those guys who have so much money that they do not know what they are going to do with it, built himself a huge labyrinth-like arena made of 20 different levels divided by tramsitters. When he noticed that he was on the doorstep to death, he disappeared with his cloak-and-dagger treasure into the deepest of the 20 levels. Since then adventurous people try to reach this level with especially equipped ships. You now accompany one of these suicide candidates on his way. Each of these levels resemble a confusing pattern of tiles and the task is to find the teleport to the next level. Arrows on certain tiles give hints to where the teleport can be found. But there are also holes, robot guards and hostile patrol ships that mean certain death. 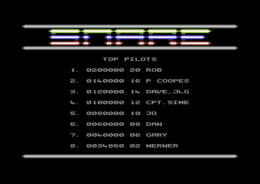 Course of the game: In Snare you control a glider, of course armoured, on the search for the end field of each level, marked by a star on the field. The glider can also jump (over gaps). Furthermore, there are different floor tiles with different effects in the 20 levels. The black tiles e.g. avoid that the vehicle can jump if you go over them, the red ones slow down the gilder to the minimum speed (but amongst others the are good for breaking after a jump). Other than in e.g. "Hunters Moon" or "Citadel" the glider does not turn here after a change of direction, but the whole screen turns by 90 degrees. This is utterly confusing, but if you get the hang of it, rather fast manoeuvres can be done. In Snare you also find the so-called switches. If you run over one, something happens somewhere. 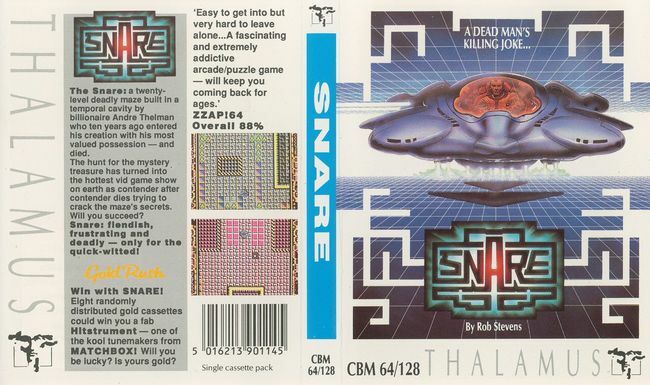 Aha, you see, Snare is not really an action game, but more a skill-action-adventure. Thalamus was a name that stood for quality. If you desist from some single exceptions, very good projects were created under this name. Snare is one of those, although it was not received equally everywhere. You can look at nice "pseudo-parallax-scrolling" in the action screen. The graphics are functional but very well done, the sound was provided by Martin Walker in usual quality and the collision query is perfect. The game is not easy, but it should be possible to finish it due to the very good and fair playability. N=Nothing, S=Score, L=Life and J=Jump level. 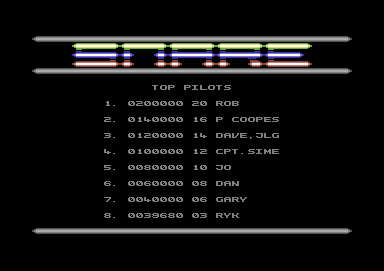 At the upper right the score is shown and at the lower right the number of lives (maximum of four). What is also possible with the glider: You can build up a wall behind you, similarly to the game "Tron", also the effect is the same. In some levels you MUST build this wall. The controls are as follows: "fire&forwards" builds wall, "fire&backwards" makes the glider jump. "Fire" alone triggers a shot. The version by "Nostalgia" offers next to the manual (separately on disk) and different trainer options also a saveable highscore list. Z-Mat: "As Thalamus fan I naturally find this game excellent. Thanks to the technical programming quality and the fair gameplay I evaluate Snare as an absolute classy shooter." Sledgie: "At the moment I do not have an opinion yet. I do not understand the controls of the game or I do something wrong. It does not seem to be a simple shooter."